Feel free to print out, color, and otherwise use my booket for personal purposes (individuals, classrooms, etc). Please contact me when you use it by leaving a comment or sending me an e-mail, and do not use my book for commercial purposes. I would love to hear feedback! Please click on the "How to Print" tab to find out how to correctly set up the .pdf to print booklet-style. You will need at least Adobe Reader 9.3 installed on your computer to view this file. Click here to download the latest version of Adobe Reader. Thanks for sharing this, Megan! Great idea & Spring's a perfect time to start this with the kids. Thanks again. Megan, this is wonderful! You give really solid advice for people to start to open their eyes from the pages of a journal. Keep sketching! 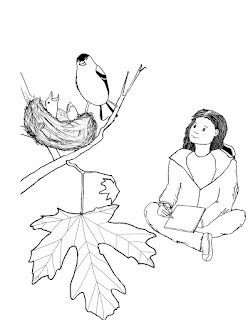 Are you the one of the authors of Opening the World Through Nature Journaling curriculum? If so, thank you so much for your kind words! My former college professor actually lent me a copy of it when I was working on making my booklet, and it really was an inspiration for me. I just looked at your website and it looks really great. If you don't mind I'd love to post a link to it on here. Thanks again! What a gift to us! Thank you! I would love to share your blog with others. What a treasure trove to have found today. I'm glad you like it, thanks for the comment! Thank you for having this available. I am using parts of the journal for a summer camp journal. I came across a hard copy of this when I worked at the Tacoma Nature center. Great to find on-line. Sorry for the late reply, but I'm so glad that you used my journal at the Nature Center, and that kids can benefit from it years after I actually made it. I actually interned at the Nature Center for a summer several years ago and this journal was inspired by the time I spent there. Thanks for the comment! Thank you! I will be using this journal as part of my girls' homeschool studies! !